The majority of respondents to an EAST poll that ran from January to April 2018 felt reassured that their bank is on top of the situation, when contacted about suspicious transactions and/or their account was blocked for the same reason. 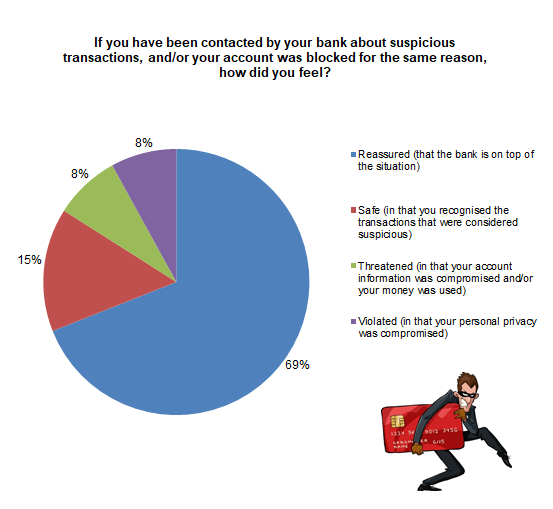 69% of respondents felt this way, while 15% felt safe in that they recognised suspicious transactions, 8% felt violated in that their personal privacy was compromised and 8% felt threatened in that their account information was compromised and/or their money was illegally used. The full poll results can be seen in the chart below. Money can only be taken from your bank account if you have authorised the transaction or your bank can prove you were at fault. If your bank detects a transaction deemed to be suspicious they may take steps to temporarily block your account, before contacting you to check on it. The current website research poll, which closes at the end of August, is on payment regulation and asks if you feel that the new Payments Service Directive 2 (PSD2), which came into force on 13 January 2018, will revolutionise the payments system. To take it, and to see all past results, visit the Payment and Terminal Research page on this website.